When writers and editors speak of “voice” in the context of fiction, they refer to stylistic qualities of attitude and personality an author employs to engage the reader, as conveyed through tone and word choice. A unique and powerful voice – think of Mattie Ross recounting her childhood travails in Charles Portis’ True Grit – can turn an otherwise mundane story into a riveting page-turner. A dull or flaccid voice, in contrast, can render even an international spy thriller into a soporific slog. That brings us to Jonathan Lethem’s latest installment in an authorial oeuvre that includes The Fortress of Solitude, his 2003 New York Times bestseller, and Motherless Brooklyn, winner of the 1999 National Book Critics Circle Award, because with The Feral Detective, Lethem’s 11th novel, he demonstrates just how effectively a potent voice can combine with an engaging story to produce masterful fiction. The appointment in question is with Charles Heist who, while not its narrator, is the novel’s titular protagonist. A self-described finder of lost persons, Heist is a laconic private detective, “fiftyish and cowboyish,” with a strip mall office and a trailer park home to which strays and runaways, not all of them human, seem to gravitate. The novel is, rest assured, much more than that, thanks largely to Phoebe’s distinctive narration – a voice in turns sarcastic and acerbic and laced with bon mots and double entendres she sends zinging over the heads of her audience. Her antic chatter masks not only her fear and insecurity as the stranger in a very strange land, but also the disillusionment of an educated woman freshly unmoored by unemployment and by the 2016 presidential election – events that are not unrelated – making her sojourn into the Mojave a kind of personal rebirth and Heist a reluctant midwife to her new and wiser self. 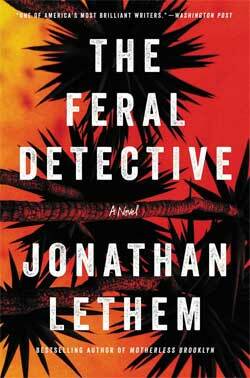 The Feral Detective ($26.99, from Ecco) is one of the better crime novels I’ve read in recent years. Draw close, and lend it your ear. From November 2018, Prose and Cons.